4.5 stars; I am expecting great things from this series. It has a lot of potential. Everything you would expect from Aguirre, great story with awesome characters, not too descript, and we get all of the necessary info from dialogue - not from an info dump. This is a spin off, so the spin character is Jael (pronounce J.L. )which I never knew in the original series - I always pronounced his name in my head: jail. But, I couldn't remember what he did in the Sirantha series...I remembered he was part of the crew they picked up along the way and he turned against the group. So, I will just tell you that he was March's ticket out of the insect prison. I don't think that is telling anything but it should jog your memory about his purpose in the Jax series. Jael took March's place in the prison cell so that the crew could make a getaway. Well, once the bugs(Velith's clan) found out they had been tricked (with March's escape) they quickly sent Jael to a permanent home on the prison ship Perdition. Perdition is a strange maximum security prison - in that the inmates monitor themselves. Interesting, huh? So, the prisoners have divided into groups on the ship...Dred's clan is the one Jael decides to join once he gets there - or rather Dred gave him an offer he couldn't refuse. Pretty much join us or die...where have I heard this before? This book is centered around the Dred Queen, but it is full of action, of course Dred and Jael have a connection that Aguirre totally teases us with...good stuff here. 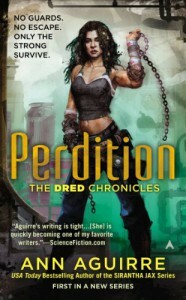 Dred needs Jael to help her survive an uprising on the prison ship. When we get back, provided we survive, you and I are having a long talk. He flashed her a cocky smile. I hope it's about our feelings. I have at least two. Possibly three. Does hunger count? Do the two of you need anything else before we go? Her boot tapped against the metal floor, the only sign of her impatience. Basically, if you love Aguirre - you will love this story. The only thing that loses a star; is the small world. Hopefully, the next book will expand their horizons. But, other than that one tiny detail - this is a must read. There is also a small mystery to solve.